Most small towns have a short track of some sort. Some are paved and some are dirt. Some are an eighth/mile in length. Most are much shorter. What they all have in common is they are a gathering point where communities go to see their local hometown heroes battle it out on a Saturday night. 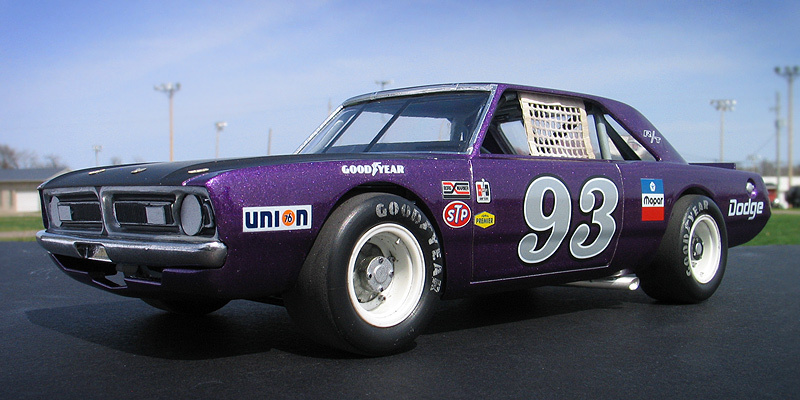 I had an extra MPC Dodge LA Dart wheel stander body and I one day was wondering what I could do with it. 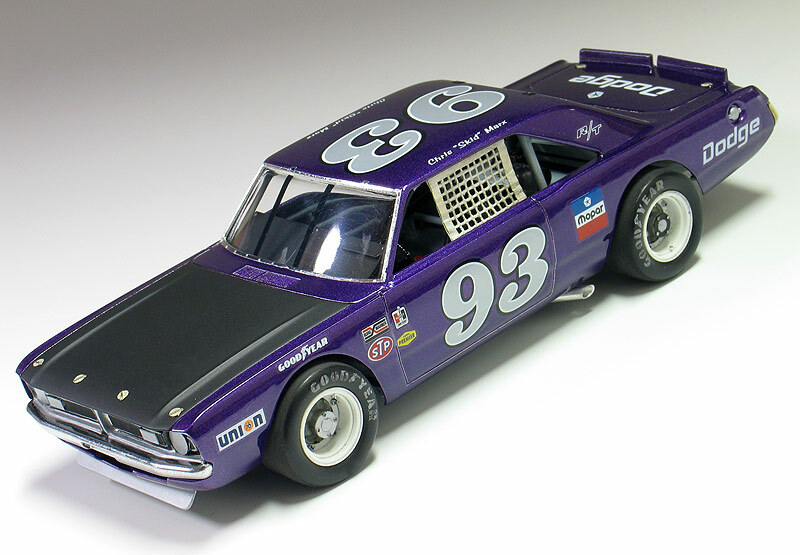 I briefly considering trying to convert the LA Dart body back to stock but this kit comes without stock trim, a trunk lid, front bumper and has large radiused rear wheel wells. 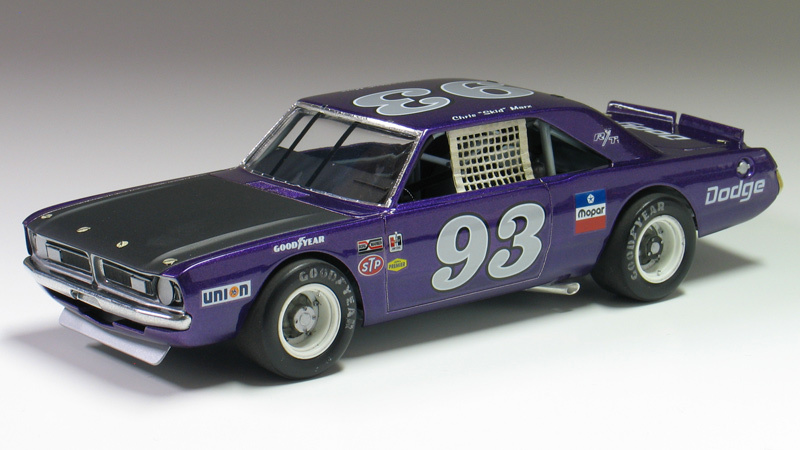 After thinking about it a little while I decided I could turn this body into a neat '70's style fictional late model sportsman short track race car. I also happened to have a bunch of MPC generic '70's NASCAR chassis too. After a little test fitting, I discovered the chassis would fit nicely with a few simple modifications to the roll cage and wheel base. 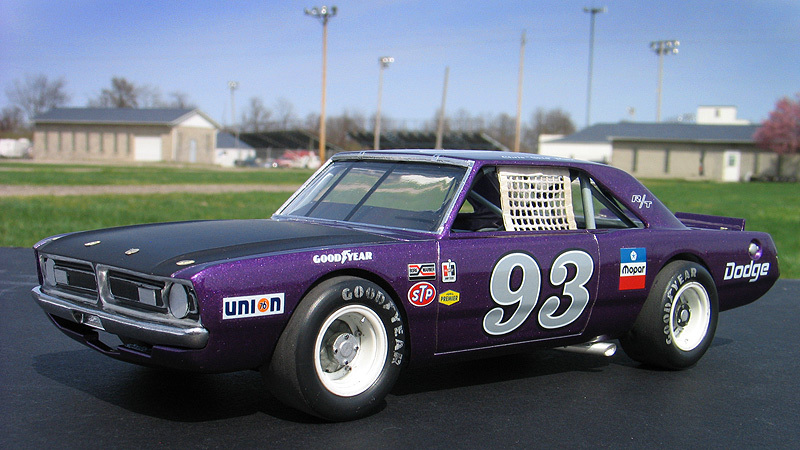 And with that... my hometown hero short track late model sportsman project was born. To convert the body into a short track car I enlarged all four wheel wells with a Dremel tool. 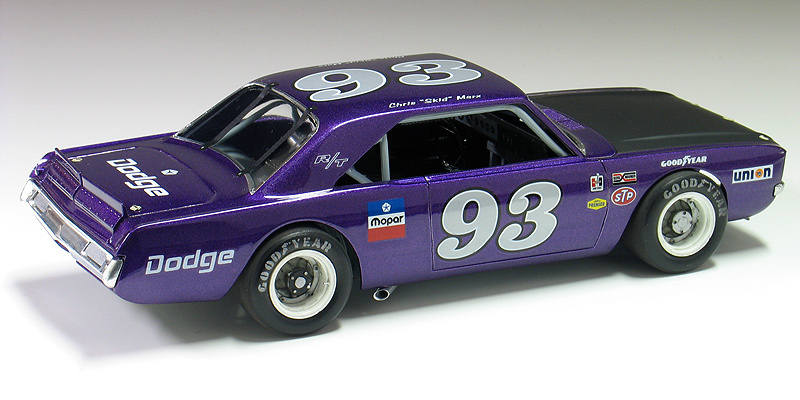 Next I bought a resin re-pop of the old AMT Petty Dart trunk lid from a vendor on ebay. The resin AMT trunk only needed a little bit tweaking to fit the MPC body. 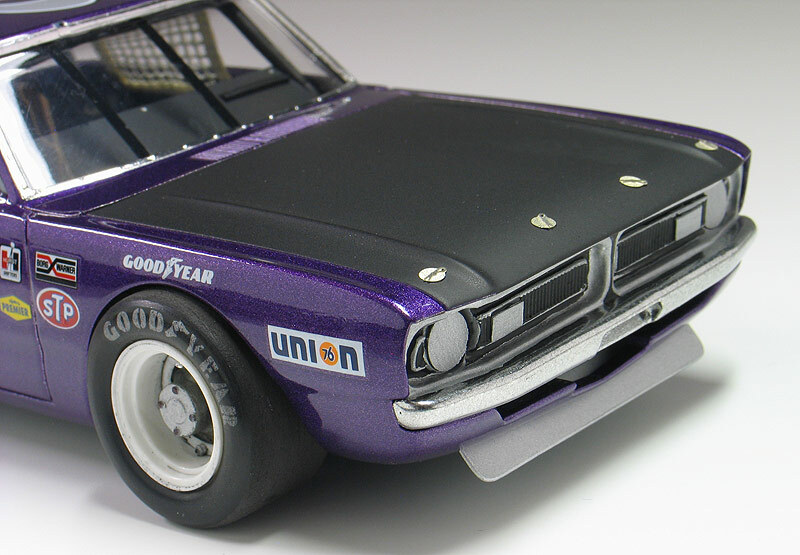 The LA Dart front grill is very simplified and does not include a front bumper or turn signals, so I ordered a resin re-pop of the MPC '71 Dodge Demon front grill and bumper combo from Hart's Parts. The Demon grill is much more accurate looking and is correct for a Dart too. 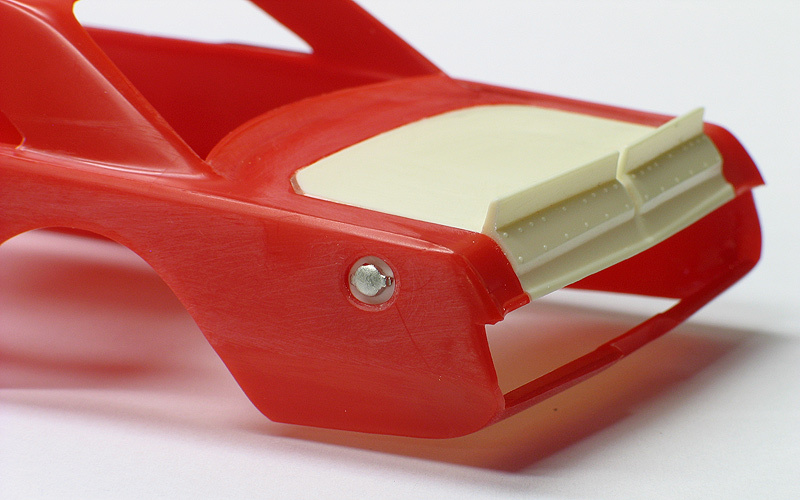 The resin grill / bumper also needed some minor tweaking to fit the Dart body. It was then painted with Alclad for a chrome look. I added head light and turn signal covers that I made from scratch. 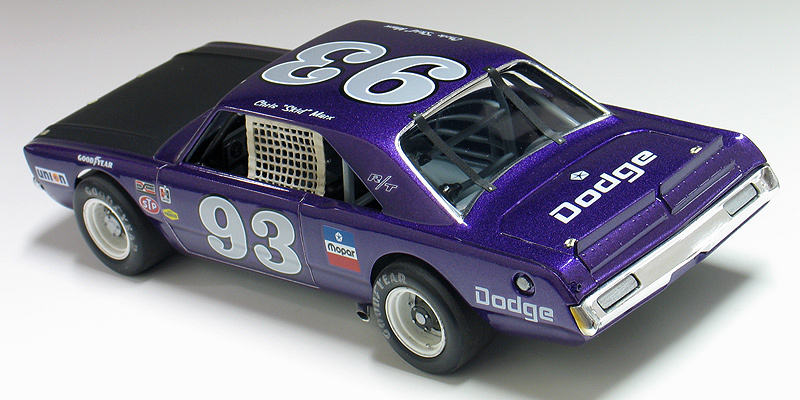 I wanted my Dodge to have an appropriate Mopar Muscle car color. 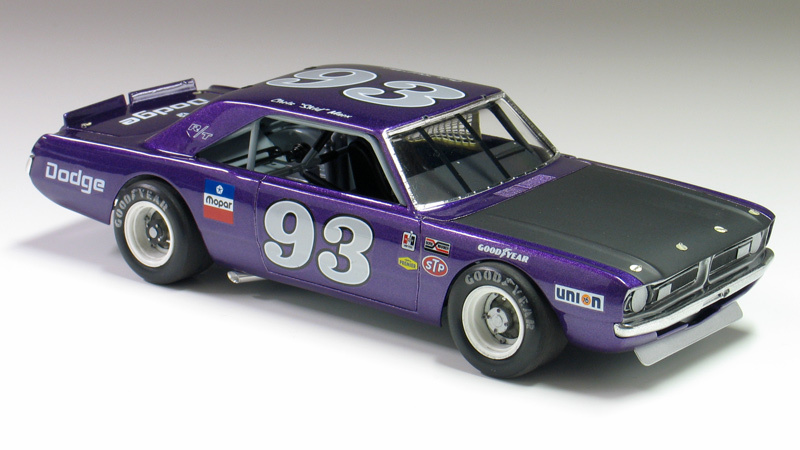 Once all the body work was done, I painted the Dart body using Testor's Plum Crazy metallic purple lacquer. 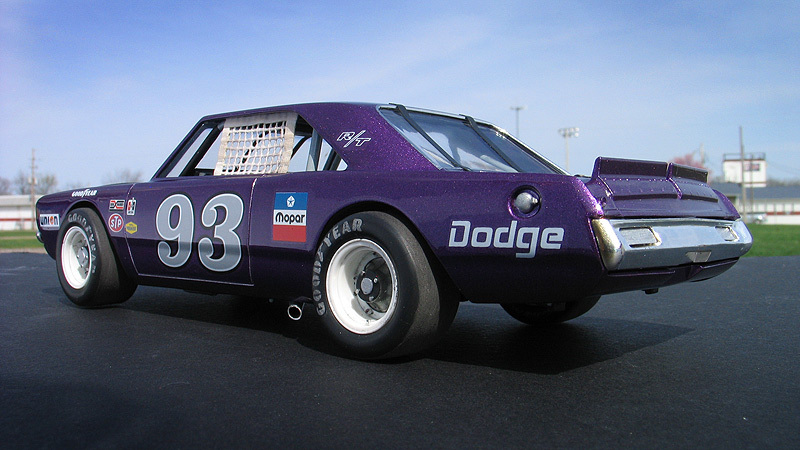 Since my car was fictional, I used decals from various Model King stock car kits I've designed decal sheets for. Then the body was clear coated with PPG urethane clear. Lastly, I painted the hood flat back and the interior / chassis gloss gray. 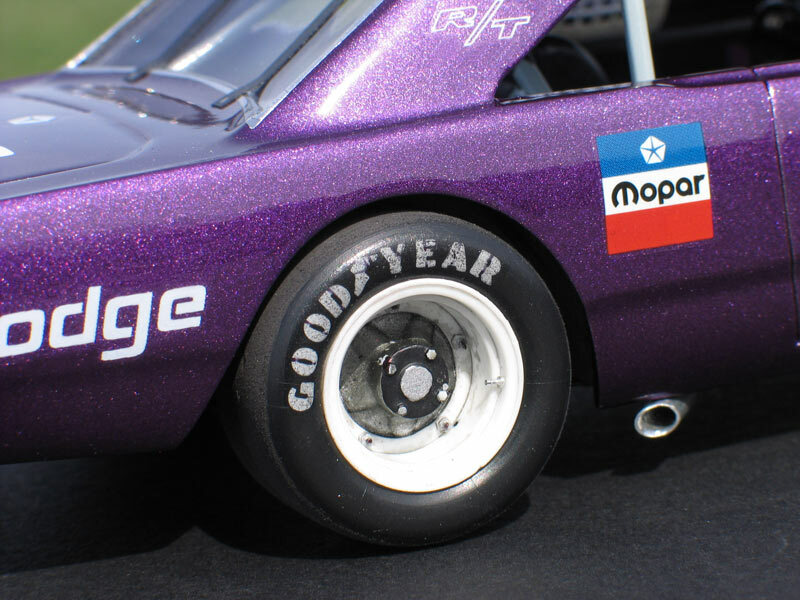 The wheels are resin pieces from ebay mated to a AMT Goodyear slicks. 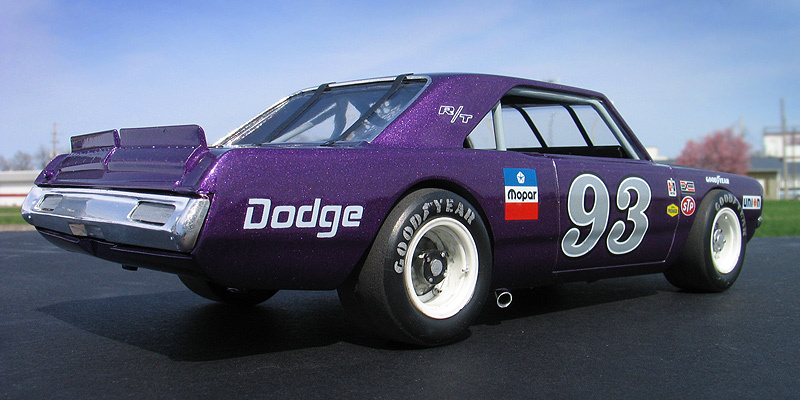 The Goodyear lettering are decals which I then dry-brushed with a little flat black to make them appear more realistic. I also added a scratch-built front spoiler, a window net, a fuel filler overflow tube, exhaust pipes made from aluminum tubing and window straps. Normally, I just shoot studio style photography where I can control the lighting more easily. For this particular model I wanted to experiment with natural light in a realistic setting. I shot the outdoor shots in front of the Columbus Motor Speedway, which is my local short track, so I could get some of the grandstands and light poles in the background. 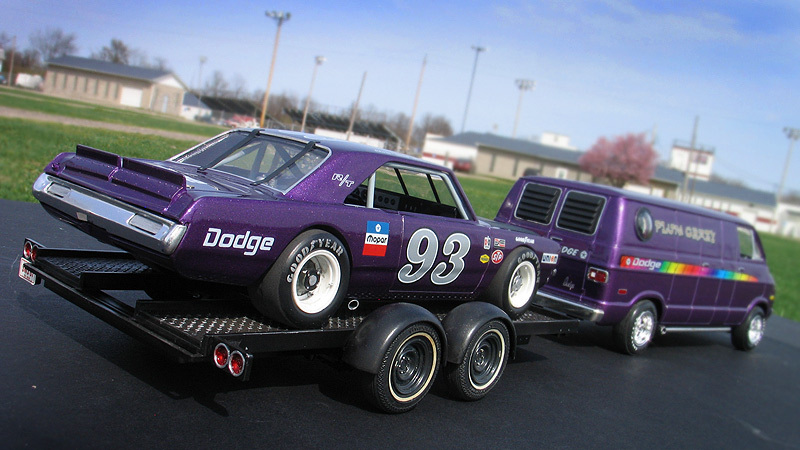 Just for fun, I also shot the Dart on an old AMT service trailer with a purple Dodge Van that I built for another project. I think they look pretty good together. When the car is shot from a low angle it looks convincingly real. 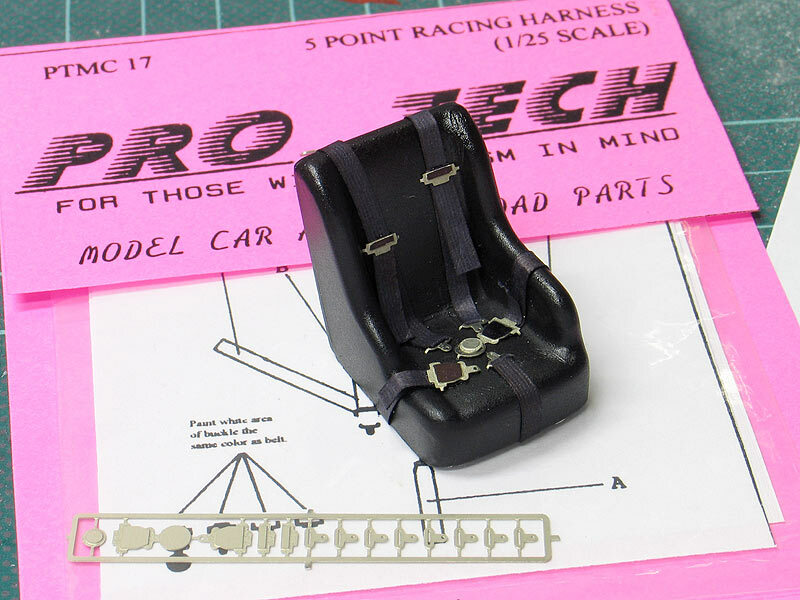 Other mods include Pro-Tech (PTMC 6) photo-etch hood pins , a Pro-Tech (PTMC 17) photo-etched 5-point harness, a Pro-Tech (PTMC 60) cast metal gas cap, and Pro-Tech (PTMC 72) machined aluminum valve stems. These are really nice parts and very easy to work with.